Since putting together my counterfeit kits, I've been dying to work with my version of 'Wildflower'. It's no surprise that it was my favourite of the kits I put together - and in fact - when I've been visiting other counterfeiters, it's generally been my favourite of their kits too! I started with one of the many photographs I took on a beautiful weekend. One I will never, ever forget. Since the memories of that weekend are so special, I decided to be really, really brave and pulled out my favourite piece of cardstock - Japanese Tea Garden from Basic Grey's Pheobe collection and used that as a base for my layout. 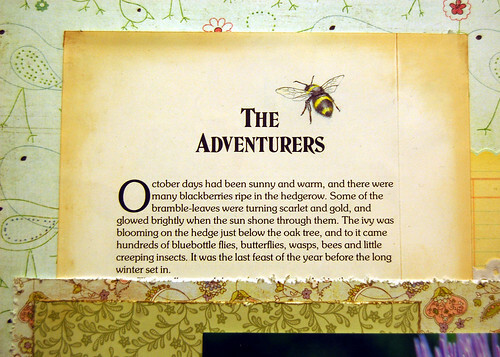 I added in a page from an old children's books and a journalling sheet from My Mind's Eye, plus several partial sheets of patterned paper from my kit. I distressed the edges of my cardstock using my craft knife and then blended some inks onto the book page to give it an aged, antiquey look. It's the first time I used my new distress inks and I'm so pleased with how they turned out - something actually worked! I swapped out the large flower from my original kit and replaced it with a pink one, then combined it with a couple of handmade flowers from last month's kit. The one I hardly used. I also added in some leaves, some of fabric and some of polymer clay - both of which have been in my stash for quite some time. Of course, I knew that I wouldn't be able to resist adding in embellishments once I started (which is why I tried not to act smug when visitors congratulated me on keeping my kit embellishments to a minimum!) But I think that the freedom to add in bits and pieces is what makes the whole process fun. Besides, it's all from stash, so it's all good. 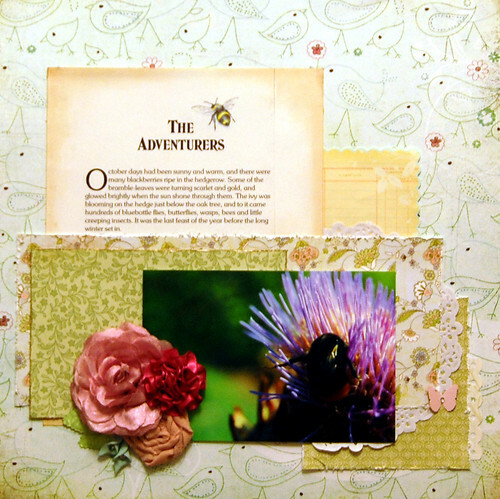 Oh I love the distress work... it looks like an antique fairy tale book. The photo is beautiful! This is just lovely. your flowers are gorgeous. This is really beautiful - oh my goodness! 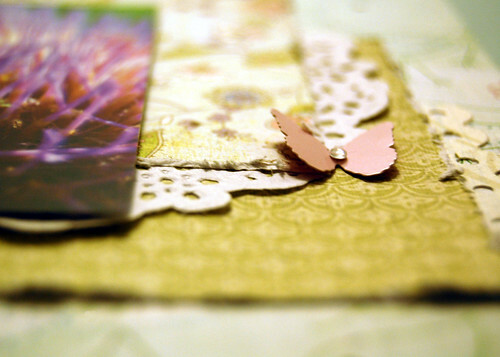 I love the papers you chose and your embellishments are lovely! This is a winner. Love your layering. That's what I need to work on and you have it down pat. Nice job! Great layout! I love everything about it! Gorgeous layout! I love those handmade flowers and leaves especially! Absolutely adorable! 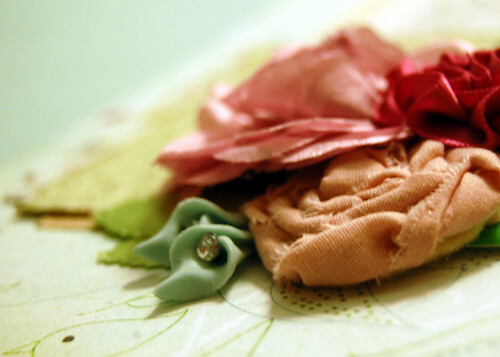 I just love handmade flowers - they add so much to any creation! Thanks for sharing!